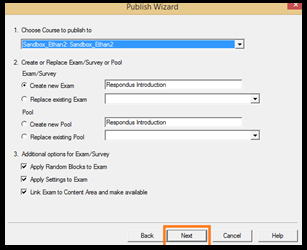 Respondus is a tool for creating and managing exams that can be printed to paper or published directly to Blackboard. Exams can be created offline using a familiar Windows environment, imported from a MS Word document or moved from one Blackboard course to another. Fort Hays State University has obtained a campus-wide license for the Respondus software. 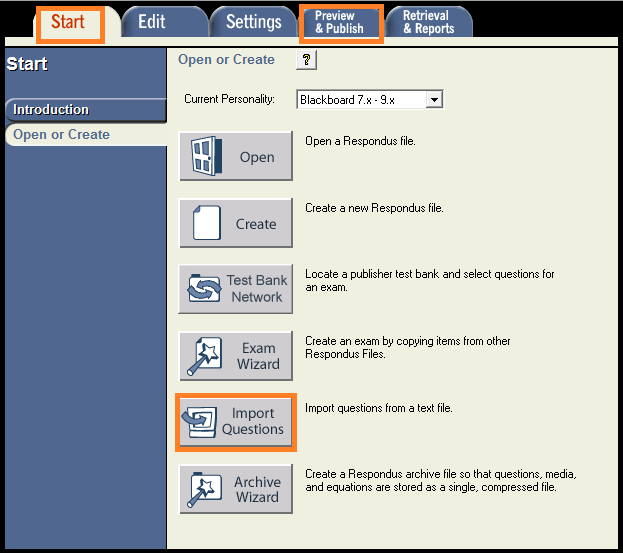 To import a test to Blackboard using Respondus, click on “Import Questions” under the “Start” tab. 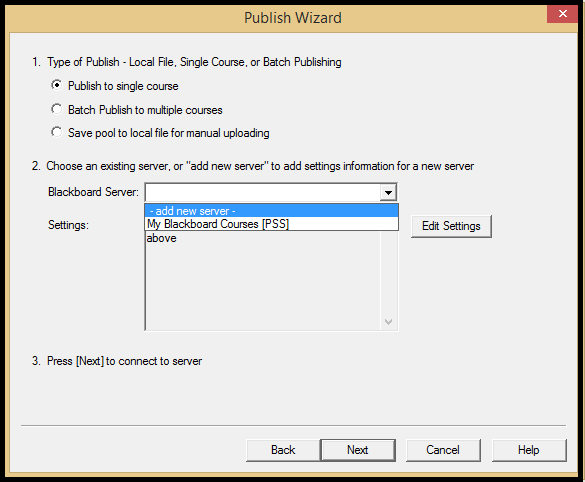 Select a Blackboard server you would like to use to open the test. If you do not have a server already created, select the “add a new server option.” If you already have a server created, skip to step number 9. 4. In the next window make sure the “Yes” option is selected and click “Next”. 5. You are then brought to a different window and you will need to select the “Blackboard at FHSU” option and click “OK”. 8. You are then brought to a window that shows the results of the connection test, click “Next” and then click “Finish” at the new window. 9. Once you have created or selected a server, click “Next” and log in to your Blackboard account and close the window after you are logged in. 11. A new pop up window will appear that asks you to choose the course you wish to publish to and will require you to fill out the test information. After you have finished click “Next”. If you are having issues importing your test to blackboard, please try these troubleshooting steps. At the top left of the respondus page, locate and click on the “Help” button. Go ahead and click on “Check for Updates”. The program will then notify you if there are any updates. If there are, a new popup window will appear. You then will want to click on the “Get Update” button. Go ahead and open Internet Explorer. You will want to log into Blackboard. Once you have successfully logged in, minimize Internet Explorer and continue with Respondus.